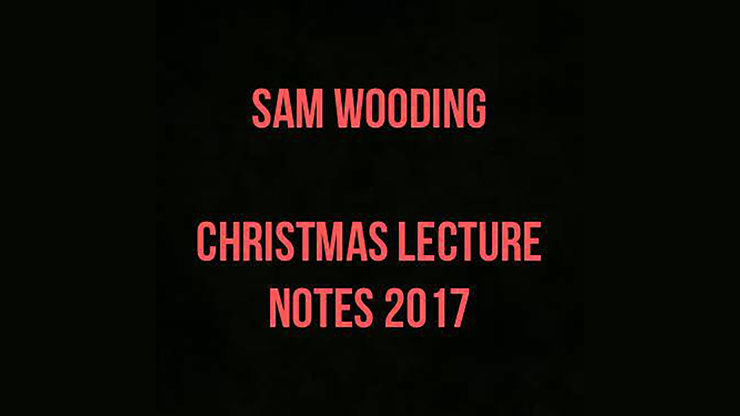 Welcome to the 2017 Christmas Lecture Notes. You'll learn propless mentalism, modern billet routines, new ways to use classic gimmicks, card mentalism and so much more. Want to know the exact details of what you are purchasing? They are listed here! The Perambulate. This is a principle that is so insane, you can literally utilize this with almost anything and still blow the spectator's mind. In these notes, you will learn how to divine a thought-of color. Stepping. A method to change the date on a coin in the spectator's hand with no switches. Access Court. A brand-new PRACTICAL method of divining the spectator's PIN code 100% of the time. (The spectator never writes anything or says anything). Pulling Colors. This is a section where I go into thorough detail on how to force every color! What is the time? This section is dedicated to watch forces and watch peeks. I hold nothing back. Frozen Card Peek. A funky, easy, practical playing card or business card peek! Curly. The performer asks the spectator to think of any word. The spectator writes down the thought-of word and signs a piece of paper, so it can't be switched. The spectator holds the paper in their hands. The performer then not only divines the thought-of word, but makes the word completely vanish on the paper. Amazingly, the paper still contains the spectator's signature! Vale 2.0. A sequel to the ever-so-popular Vale technique. Dot. This is a routine where the spectator thinks of three important people in their life (Sister, Mother, and Grandmother). The spectator says each of their names out loud. The performer instantly tells the spectator which name matches the specific family member. The Year Deck. The spectator names a year. The performer spreads out a deck of cards with celebrities on each playing card. The spectator looks through the cards and picks a celebrity. They then look up the celebrity on the Internet and the thought-of celebrity matches the year they named at the very start! Treat yourself and perform these amazing effects with the 2017 Christmas Lecture Notes!